Here at Creative Cakecraft we can make you any cake that you want, for any occasion! On our site you will find examples ranging from the traditional to the bizarre, and everything in between. Visit our gallery now for inspiration! Our fruit cakes are matured for months to really bring out the intense flavours, while our sponges are made from fresh ingredients right before your big day to make sure they are as delicious as they can be! With our tried and tested recipe your guests will be coming back for seconds. We never use pre-made cake mix, there really is no substitute for the real thing. If you’re looking for something a little different we offer a variety of flavours – lemon sponge is a particular favourite – and we will gladly follow your own recipe too! Why not have different flavours for different tiers of your wedding cake? We can also cater to any dietary needs (e.g. gluten free or allergies), please don’t hesitate to ask. But if you really want to know how good our cake is, come in and try some! 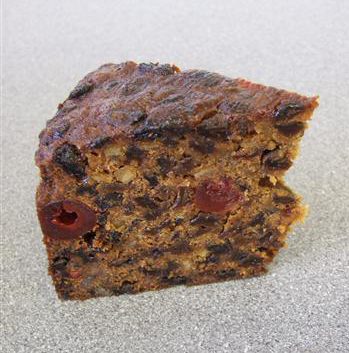 We bake two main types of fruit cake; our traditional rich fruit cake is made to a recipe that we have used for many years now and matures to be bursting with flavour, while our light fruit cake is for those who enjoy a slightly more subtle experience. Both are deep enough for a generous portion, and beautifully moist. A slice of rich fruit cake, delicious! We never use premade cake mix, all our cakes are made on site with the freshest ingredients, so all our cakes taste as perfect as a home made cake. 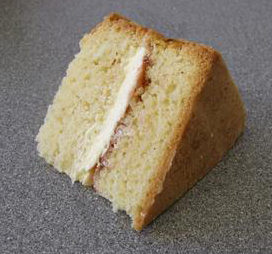 Sponge cake can be filled with jam and buttercream, lemon curd or chocolate ganache depending on the type of sponge and your preference. Orange, carrot or coffee cakes are also available with fillings to suit. There is no rule saying all the tiers of your cake must be the same, you can mix and match however you like! 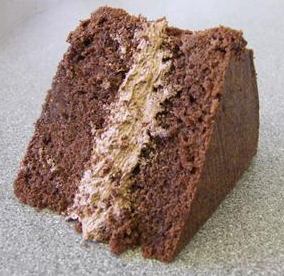 The base layer of a stacked cake may need to be fruit in order for it to be strong enough to support the others.